This is a recent book of 144 pages in length, illustrating over 250 species of birds in 335 full color photographs one might likely see in South Florida . This area is defined by the authors as an area “extending south of route 70, broadly from a line drawn from Fort Pierce to Sarasota, and also includes the Keys and the Dry Tortugas”. This book is a handy compendium meant to aid birders, and especially visiting birders, who may not want to carry several field guides or larger tomes while traveling, for use in bird identification. As a “pocket book” (4″ by 7.5″), the authors state that this book is not a complete guide and that other works are needed to compliment it. They proffer other more well known field guides such as the National Geographic Field Guide to the Birds of North America, (3rd edition) and the ABA/Lane Guide: A Birder’s Guide to Florida by Bill Pranty as supplemental reading. Further, the authors realize the limitations of a single photograph of a single species for the use of bird identification. (Cf. the pictures of Northern Rough-winged Swallow or Chimney Swift as examples!) Given the fact that the authors are not resident Florida birders, I feel that they did a very good job of organizing the material as well as making it available in an easy-to-read format. The latter is accomplished through the use of colored corner tabs representing the various avian families. Noted East Coast Florida birder Wally George is credited as having supplied the range and distributional data for the birds of Southern Florida. 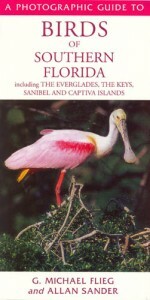 Chapters of the book include: Introduction, How to use this book, Birding habitats in southern Florida, Key to corner tabs, Where to find birds in southern Florida, Species descriptions, Glossary, Further reading, Useful addresses and Index. The most useful aspect of this book, in my opinion, is the chapter on birding habitats and the species one may encounter in them. Knowing what can be expected to be seen in a given habitat makes it easier for the birder to maximize one’s time birding and the species to be seen, especially in unfamiliar locations. Another useful aspect of this book is the photographs of several of the “exotics” including psittiscids and mynas one might encounter in South Florida. Rose-ringed Parakeet, Budgerigar and Yellow-headed Parrot are illustrated as well as Common and Hill Mynas. My only wish would be for more psitticid photos such as White-winged and Yellow-chevroned Parakeet, as well as Black-hooded Parakeet and perhaps Monk. Still, some photos of exotics are better than nothing. The glossary is another useful section of this book, but one can understand its limitations given the books size. In short, I would recommend this book to anyone who wants to add to their library of local bird books covering our area of South Florida. In the field, it is an easy book to put in one’s shirt pocket when carrying other larger books is impractical. I would also recommend it to visiting and casual birders with the admonition to supplement it with a more thorough avian treatment such as National Audubon’s The Sibley Guide to Birds. * Available locally in the Fort Myers area from The Book Collection, 15271-28 McGregor Blvd. (McGregor Point Shopping Center), Fort Myers, FL 33908. Phone: (239) 481-3112.